In stock -This product will ship today if ordered within the next 1 hours and 42 minutes. 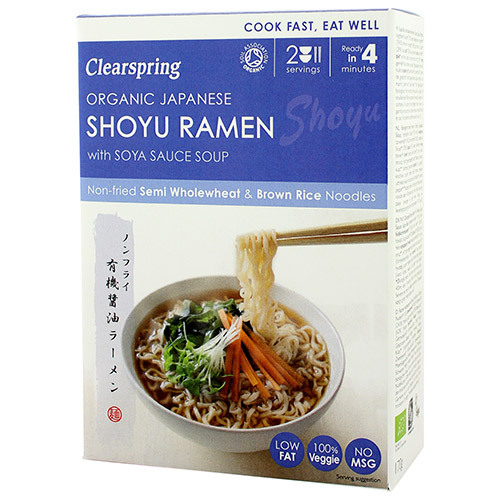 Clearspring Organic Shoyu Ramen Noodles with Soya Sauce Soup makes a quick and satisfying meal with all the flavour of the finest wholesome ingredients. Ready in just four minutes. Contains 2 servings. Contains the natural goodness of brown rice and rich flavour of traditionally made Japanese soya sauce. With no added nasties like MSG, artificial flavours or colours to worry about, this great tasting, 100% vegan ready meal is the ultimate way to ‘cook fast and eat well’. Noodles* (71%): Semi wholewheat flour* (74.5%), brown rice flour* (24.5%), sea salt. Soup Base* (29%): Soya sauce* (62%) (water, soya beans*, wheat*, sea salt, grain alcohol*), rice malt syrup* (rice*, sprouted barley*, water), sea salt, water, kuzu* (starch thickener), toasted sesame oil*, onion purée*, garlic purée*, ginger purée*, kombu sea vegetable extract (water, kombu, sea salt), black pepper*, white pepper*. Place 400ml of water in a saucepan and bring to the boil. Add the ramen noodles and cook for 4 minutes, stirring occasionally. Add the contents of one soup sachet just before turning off the heat and mix well. Serve with your favourite toppings. Place the noodles in a microwave-safe bowl and add 400ml of boiling water. Cook uncovered on HIGH (650W-850W) for 5 minutes. Add the contents of one soup sachet, stir well and serve with your favourite toppings. This box contains 2 servings. 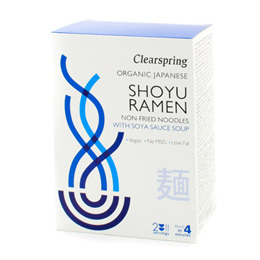 Below are reviews of Clearspring Organic Shoyu Ramen Noodles with Soya Sauce Soup - 150g by bodykind customers. If you have tried this product we'd love to hear what you think so please leave a review.